I posted an answer to this question which I felt was pretty good. The answer received one upvote then the next time I view the answer it is deleted with no information as to why. To directly answer your question, the first and obvious thing that pops into my head is to remove the CMOS battery and press the power button (Make sure the laptop has 0 power), this will reset the Bios to default factory settings. Note that your default OS may not boot correctly until your Bios is re-setup. I would say that my answer could stand alone if it was the following sentence alone. Am I supposed to provide step by steps instructions on how to tear down this individual laptop and/or not answer because I don't know this information? General information like, removing CMOS to reset BIOS is useful for future readers. 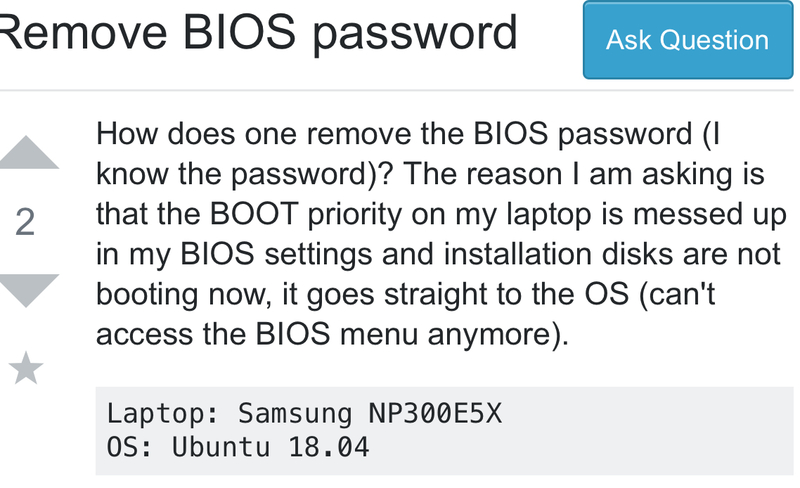 "To directly answer your question, the first and obvious thing that pops into my head is to remove the CMOS battery and press the power button (Make sure the laptop has 0 power), this will reset the Bios to default factory settings." Changes I will make that I have gleaned from comments/answer. In my albeit limited experience I have never had a CMOS pull NOT reset the Bios PWD. The following answer is from another user from 2013 who has the same device NP300E5X-T02AE as the author of the question which you submitted your answer to. I bought online code from ebay and it works now. the warranty service told me that bios IC should be replaced , replacing battery does not work on new samsung laptops. Yes there is. It’s called EEPROM memory which is set electronically. EEPROM stands for Electrically Erasable Programmable Read-Only Memory and is a type of non-volatile memory used in computers and other electronic devices to store relatively small amounts of data but allowing individual bytes to be erased and reprogrammed. Removing the CMOS battery does not reset the supervisor password most of the time. Removing a CMOS battery does not typically restore the default settings resulting in the supervisor password being reset. If it did then, the supervisor password, would not be a very helpful security feature. Many others have said this in the past to past questions, so I am not alone, in not having much luck with removing a CMOS battery from a laptop. I voted to delete the answer due to link to the YouTube video. We expect answers to be self-contained, if the YouTube video were to become inaccessible, that part of your answer wouldn't be very helpful. You also linked to two different resources, didn't quote and cite any information, so if the content were to change or be delete (in the case of the linked Super User answer) your answer would not contain the required information to answer the question. The most important reason I voted to delete your answer, answers should only contain text and uploaded images, linked videos are rarely appropriate, due to the fact Stack Exchange does not provide an "upload video" functionality. Unless you are quoting and citing relevant information from an existing answer, most of the time you should the flag the new question as a duplicate of an existing question, instead of just linking to an existing question's answer. This is, of course, is due to the fact we're not a forum so linking to "past answers" isn't actually considered to be an answer. I've never had an answer just deleted, I would think a downvote would be more appropriate. I actually did downvote your answer due to the fact it contained that YouTube video. I also voted to delete your answer because of the YouTube video. I normally assume a link to YouTube video is done to increase the revenue on the video itself. In my experience, an answer which contains a link to a YouTube video, rarely answer the question by themselves. Which of course is a problem for a website based on images and text. Besides, you have had several answers, which were considered to be commentary, deleted due to them being commentary. The answer couldn't stand on its own. When having links in answers, you should summarize the information, so users don't need to click around (possibly to sites that moved their documents or content) to get the information they need. Not the answer you're looking for? Browse other questions tagged discussion deleted-answer .